Homeowners and landscapers who want a powerful aerator in a compact design need not look farther than the 424. 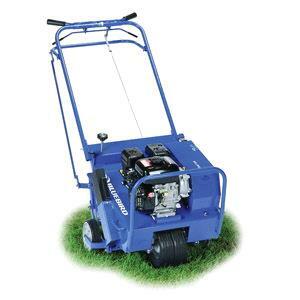 The machine is simple to use and features a working width of 17.5 to aerate over 20,000 square feet per hour! The 424 is easy to maneuver, while the built-in lift handles and removable front weights assist in the loading process. The clutch lever is integrated into the folding handle, and easy-to-use depth controls give precise and consistent coring depths up to 3 . Available with Honda GX120 or Briggs & Stratton 950 Series engines. * Please call us with any questions you may hav about our aerator 20 inch drum type powered rentals in Wayzata MN and the Western suburbs of Minneapolis.